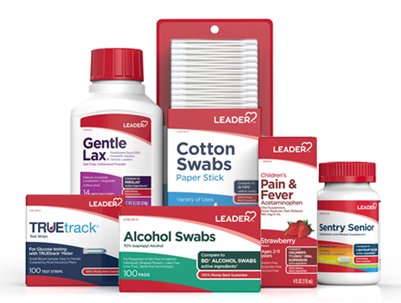 With the same quality as national brand products and excellent profit margins between 40% to 50%, the products of the LEADER™ brand offer opportunities to maximize your profits. By promoting this products you can increase profitability in consumer products, tracing the path for financial growth and success of your pharmacy. Profit growth for your pharmacy and savings for your customers. No risk, 100% money back guarantee. The same active ingredients as their national brand OTC counterparts—at an affordable price. Provide a point of difference for your store. Make your pharmacy the preferred destination for consumers looking to make smart purchases of items they need, with the quality they expect and the value they deserve. Visit www.marcaleader.com to see our products, offers and useful tips you can share with your patients. ©, Cardinal Health. Todos los derechos Reservados.